Our clients can avail from us an exclusive range of Oil & Gas Burner Diffuser Plates & Blast Tubes, which are used for burners. These products have various plates and tubes and are give a better performance to our valued clients. Our products are manufactured using superior quality raw materials. 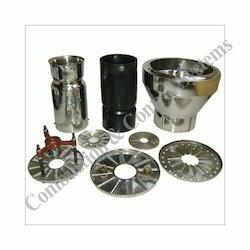 We offer these products as per they meet the requirement level of our clients. Looking for Diffuser Plates and Blast Tubes ?